A friend told me the critics, both in print and online, have been savaging this film, but when I checked its ratings on RottenTomatoes.com it had a middling score of 41, hardly the scathing ratings of, say, The Last Airbender (which at latest count had a RT score of only 8 out of 100!). I went into this film expecting a light, humorous, special effects-filled bit of summer fluff, and that's exactly what I got. Nicholas Cage stars as Balthazar Blake, a master sorcerer from the 8th century, who's been seeking a prophesied apprentice with the mystical skills to kill off Morgana la Fey. 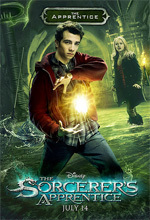 Nerdy, nasal-voiced Jay Baruchel (I kept thinking I was listening to Christian Slater talk) is the titular Apprentice, Dave Stuttler, a college physics geek who has tried to forget his one encounter with magic back in grade school and get on with his life. Alfred Molina plays the villainous Maxim Horvath, a fellow sorcerer from Balthazar's era, who is intent on releasing Morgana from a magical prison, so that she can bring about doom and destruction on Earth. And Teresa Palmer plays Becky Barnes, Dave's grade-school crush, whom he's finally getting to know in college, until all the magical chaos erupts. The plot is pretty simplistic, and there's logic gaps scattered throughout. But Baruchel's and Cage's performances are enjoyable, and they've got pretty good chemistry together as Master and Apprentice. Too bad the same can't be said for Baruchel and Palmer, who never really clicked on screen for me at all. Molina chews the scenery up with relish, particularly when he's forced to deal with an apprentice of his own, who's turned his magical talents into a Vegas-style illusionist's show. The special effects were well done. I enjoyed the soundtrack. And the little tip o' the hat to the Mickey Mouse animated version -- in which Dave animates mops and brooms to clean up his laboratory while he takes a shower...only to have it go out of control -- was a very nice touch. Sure...there could have been a stronger story. Sure, there could have been even more effects. But, as it stands, I found The Sorcerer's Apprentice to be a quite watchable comedic action film. Nothing I'd buy on DVD to keep, but certainly entertaining enough to see in a theater -- where the special effects can be enjoyed better than on a small TV screen. I'd easily give it three stars. Your mileage may vary. I find it fascinating that one of my favorite actors this year has been Jay Baruchel. First, as the voice of the lead character in How to Train Your Dragon, and now as Dave in this film. I don't know what it is about him, but I find him to be a fun guy to watch and/or listen to.